Vertetrac clinical information page. Vertetrac treatment purposefully enrols the patient into moving whilst donning the equipment. Why? Well quite simply because research demonstrates that the transfer of fluid is essential for the normal biomechanics of the disc and is only possible when the spine is in motion. The traction decreases intro-discal pressure on the nerve root and dural sac. Disc disorders include muscle spasm and a reduction in the transfer of fluid which in turn accelerates disc degeneration. So it stands to sense that by combining motion with spinal decompression, which simultaneously decreases pressure, enables fluid exchange, and improves the Range of Motion (ROM) which will in turn afford a rapid recovery and concurrent reduction in pain. 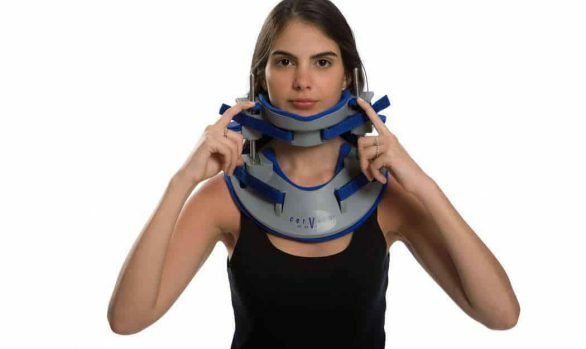 Note: With Meditrac’s device, symmetrical or asymmetrical spinal decompression may be applied as necessary, depending on the patient’s complaint. It can apply force in the x, y, and z dimensions. In order to fully understand the benefit of dynamic vertical traction in the treatment of low back pain, let us first examine the causes of the illness. Normal functioning of the intervertebral disc is possible when vertical force acting on the nucleus pulposus is smoothly transmitted into a horizontal force, acting on the annulus fibrosus. In these circumstances the intervertebral disc performs its function much like a rubber tire. It is an excellent shock-absorbing structure, and the mechanism of interplay between the nucleus pulposus and the annulus fibrosus is correct. With increased degeneration of the disc, the transmission of the vertical thrust into a horizontal component is disturbed and the condition becomes symptomatic. Nachemson explained that an increase in intradiscal pressure leads to gradual loss of normal hydrostatic mechanical behavior of the disc. This in turn leads to posterior displacement of the nucleus pulposus and to its impingement on posterior structures of the annulus fibrosus, which is richly innervated with sensory and sympathetic fibers of the sinuvertebral nerve, and causes pain which is initially concentrated only in the lower back. The annulus fibrosus becomes subject to greater stress, and subsequent degeneration and further increase of intradiscal pressure may cause it to rupture, enabling an extrusion of the nucleus pulposus. This is the most advanced stage of disc herniation, and is accompanied by sciatic pain which can seriously debilitate patients. A 47 year old female suffering from acute lower back pain, severe sciatica on the left side with neurological signs, severe left neural foraminal herniation of the disc (red arrow above) causing stenosis with mild spinal cord pressure. Treated included two weeks of daily treatments followed by two months of treatments every other day. Following the treatment the patient showed no signs of pain, sciatica nor any neurological signs. 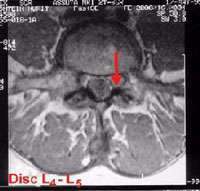 The MRI showed no disc herniation with mild edema of the left root but without spinal cord pressure. Idiopathic scoliosis (juvenile, adolescent or adult) click here for more information regarding the DBS Scoliosis Rail attachment to extend treatment possibilities. It is well known that spinal decompression therapy has long been an accepted form of mechanical treatment of disc disorders, but until relatively recently, the results of the treatment have been unsatisfactory. From the studies of the Institute for the Treatment of Spinal Disorders, it is concluded that those disc disorders which are of mechanical nature can only be successfully treated using mechanical methods, and spinal decompression therapy proved to be the best option. Furthermore, we found that the poor results previously obtained in treatment using traction relate to poor technique, and not to the concept of traction itself. Previous forms and techniques of traction simply failed to provide enough vertical + horizontal traction to relieve compression on the intervertebral discs. The conclusion leads us to the concept of 3 dimensional forces. 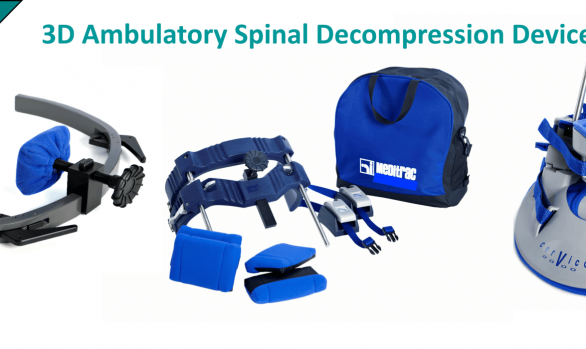 The Vertetrac spinal decompression device is designed to decompress the spine, put it under spinal traction, while the patient walks at a comfortable rate. 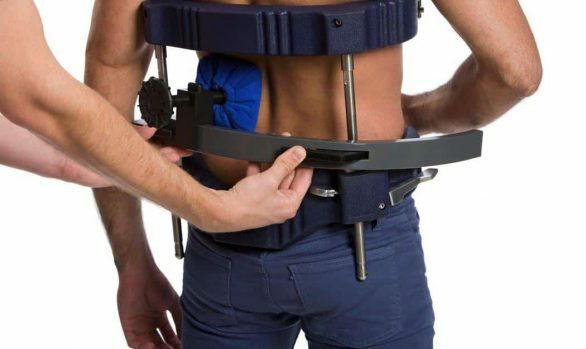 It is an innovative method, developed to treat a number of spinal injuries and disorders, including: lower back pain, sport injuries, herniated (slipped) discs, sciatica, bulging discs, lumbago and even idiopathic scoliosis (by adding the Dynamic Brace System (DBS) Scoliosis Rail attachment to the Vertetrac). Because the Vertetrac spinal traction device affords vertical, horizontal, symmetrical and asymmetrical traction, it actually performs better than traditional decompression methods such as body braces and 2D decompression traction tables. The other reason why the Vertetrac spinal decompression device performs better than traditional traction tables is because the decompression is implemented whilst the patient is in motion, and in 3D – in the vertical and horizontal dimensions over time. 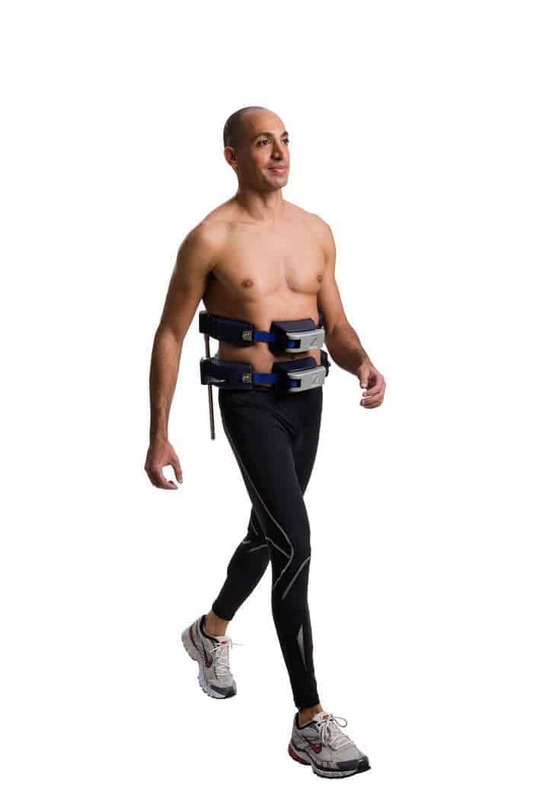 We recommend that the patient walks at a comfortable rate, either on or off a treadmill, while wearing the Vertetrac. This method accelerates the healing process and return to quality of life, not to mention the significant reduction in pain, even after a single treatment of 20 minutes. Over 10,000 low back pain sufferers ( 56% men and 44% women between the ages of 17-79) have been treated at The Institute for Treatment of Spinal Disorders in Tel Aviv, Wooridul Hospital Spine Laser Clinic in Seoul, Korea, and other back institutes. The success rates of 85%-90% during these spinal decompression therapy sessions have never been seen in any other form of treatment of herniated discs. Also no harmful or negative side effects have ever been observed with the Vertetrac spinal decompression therapy during testing and subsequent patient use. The Vertetrac spinal decompression therapy device successfully treats lower back pain and sciatica caused by inter-vertebral disc and other spinal disorders. While most treatment methods target the symptoms of the problem — back pain and sciatica — the Vertetrac dynamic ambulatory lumbar 3D treatment device targets the source of the problem: the herniated disc itself. Unlike other traction methods, the Vertetrac enables the application of both vertical and horizontal forces, thus amplifying the effectiveness of the traction. 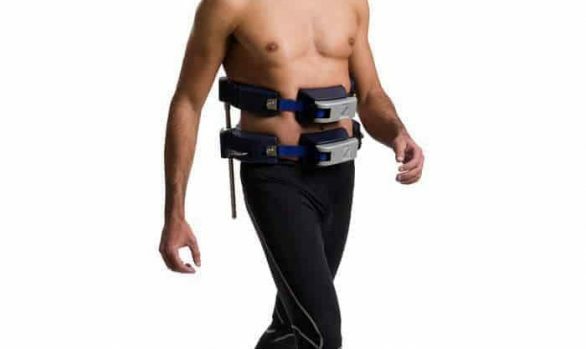 Also unlike other forms of spinal decompression, which loose a large amount of the traction force, the Vertetrac applies a vertical force greater than the weight-bearing force of the upper body (up to 40 kg). This frees the intervertebral disc from the force of compression and friction and allows for the extruded parts of the disc to return to the healthy, neutral position. 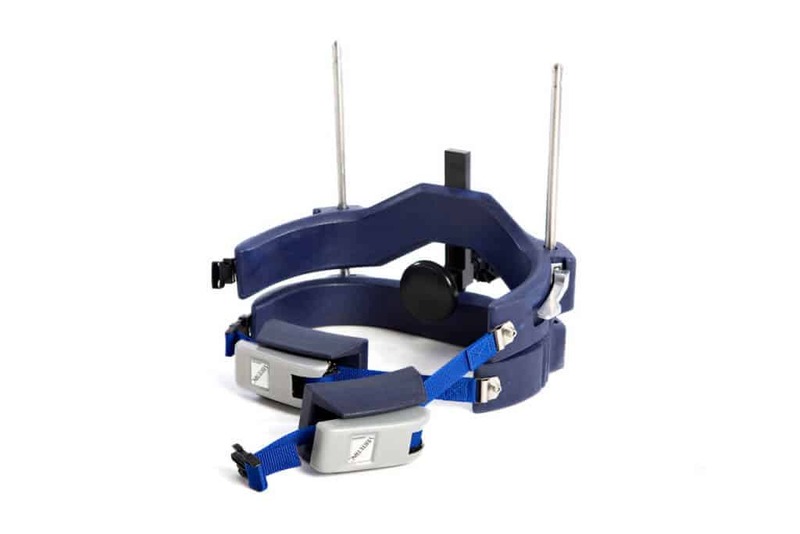 The Vertetrac spinal decompression therapy device comprises two U-shaped frames which are connected by two traction rods, one on each side of the device. The frames are made of a strong, flexible material and are padded for maximum comfort and durability. 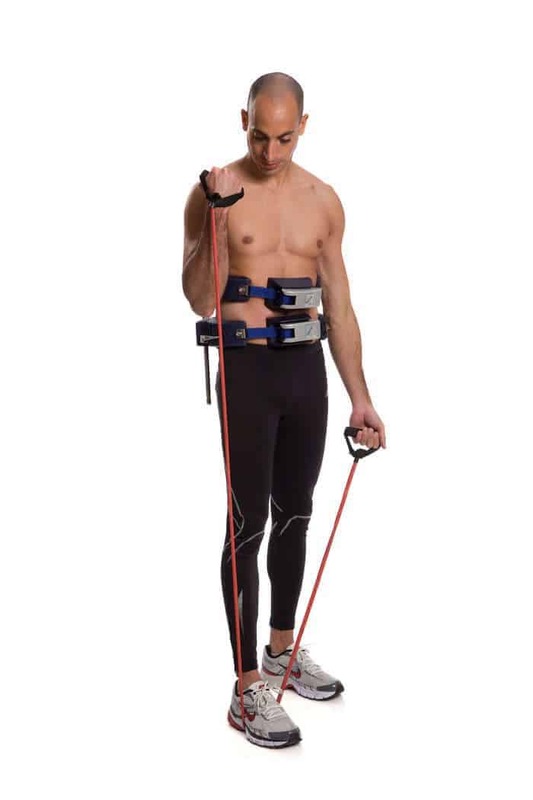 These flexible frames are attached to the body with a simple, easy-to-use strap and ratchet system. This system allows for the maximal strength, safety, comfort and adjustment with minimal complication and difficulty to the patient. The lower frame is fitted onto the patient’s body and rests firmly just above the iliac crests of the pelvis; it remains stationary during treatment. The upper frame fits tightly around the thorax and is strapped below the sternum. Traction force is easily applied by the physician or the patient using the jack mechanisms on either side of the Vertetrac, causing the upper frame to move upwards and thus applying a vertical thrusting force directly to the lumbar spine between the pelvis and the thorax. This eliminates a large amount of friction, which in other methods of traction greatly reduces the efficiency of the treatment. The jack mechanisms are operated independently in order to apply symmetrical or asymmetrical traction, or to release traction as needed. By jacking one side of the Vertetrac more than the other, asymmetrical traction can be applied for the treatment of sciatic scoliosis and other disorders. 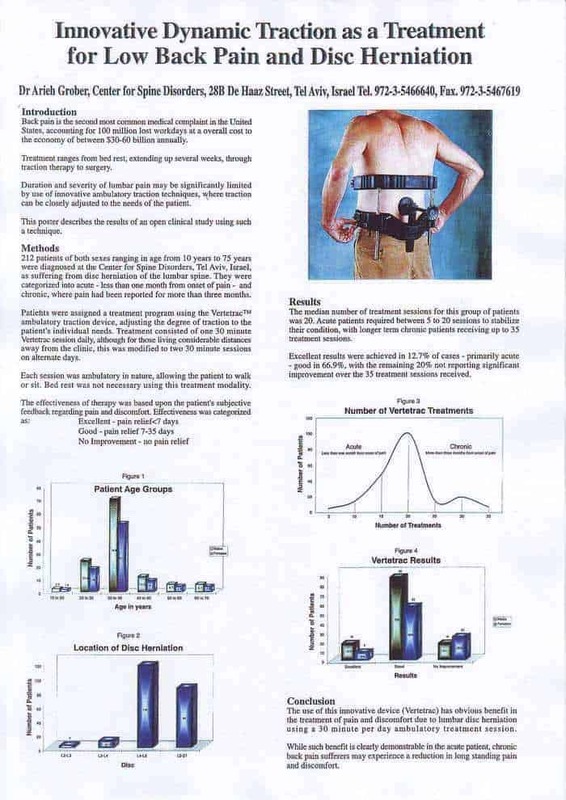 Application of this vertical thrusting distraction force greater than the weight-bearing force, causes a negative pressure on the disc, encouraging a suction force on the herniated disc. The application of horizontal force facilitates the realignment of the disc by causing additional tightening of the post longitudinal ligaments over the discs. This force is applied by tightening the screw attached to the lower frame and to the horizontal pressure pad. The horizontal pressure pad slides vertically for adjustment of the device to different patients and to enable the application of force directly on the spinous processes L3, L4 or L5. This adjustment allows for the application of horizontal force directly onto the damaged area. In most cases, the patient will feel immediate relief from the sciatic pain and discomfort of low back pain upon application of horizontal pressure upon the afflicted processes. Vertetrac spinal decompression therapy is individualized, as it is based entirely on the comfort level of the patient, and in one size fits all. The arms of the Vertetrac braces are strong yet flexible enough to allow for a wide variety of body shapes when the Vertetrac is attached to the patient with the strap and ratchet system. 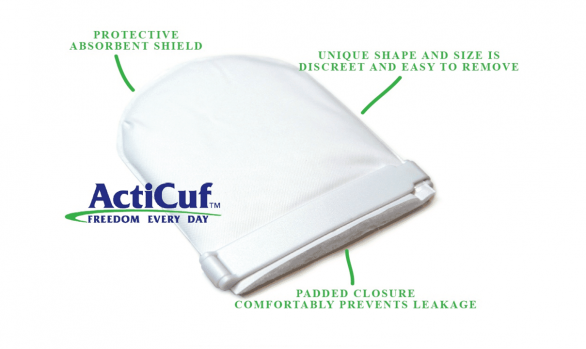 In cases of smaller than average patients, an additional set of pads is available to ensure that the smaller body is comfortably padded. In cases where the patient does not have a flat stomach, the pads may be placed beneath the ratcheting systems for extra comfort. In all cases, the traction should not cause severe discomfort or pain, and the onset of pain indicates improper placement of the device and it should be removed and refitted. Each treatment session lasts approximately 30 minutes, allowing the patient the freedom to walk, sit, or stand, according to his or her preference. Testing has established that the success rate of the treatment is greatly enhanced when the patient is walking, and for this reason many administering physicians and practitioners ask their patients to walk on a treadmill during treatment, or up and down a corridor. In acute cases, the treatment period should last from 10 days to two weeks every day. In cases where the patient is already asymptomatic and the disc herniation has been successfully treated, it is recommended that the Vertetrac be used in its prophylactic capacity. 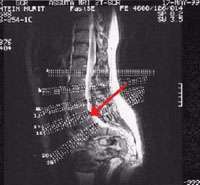 Used weekly, the deloading effect of the Vertetrac treatment prevents the recurrence of disc protrusion in most cases. Past testing has shown that the occasional deloading of the spine with the Vertetrac gives good results on the treatment of recurrent disc lesions. This prophylactic treatment on the disc also promotes the growth of new blood vessels in the disc region and increases circulation. There are many advantages to the use of Vertetrac traction for the treatment of lower back pain. Not only is powerful vertical traction applied to the lumbar spine but simultaneous horizontal pressure can also be applied directly to the damaged disc, thus making the Vertetrac more effective than any other conventional form of treatment. Furthermore, treatment using the Vertetrac often eliminates the need for hospitalization or medication, and significantly reduces the number of working days lost due to back pain. The Vertetrac affords symmetric as well as asymmetric spinal decompression. Chronic back pain patients typically purchase the Vertetrac spinal decompression device so that they can use it once or twice a week to keep their chronic back pain at bay. Because it is portable and relatively light (5.3kg), they can even pack a Vertetrac in their suitcase to avoid missing their treatment sessions. The unit is compact, lightweight, and portable, and can be taken to the patient’s home for treatment of particularly severe cases and may be used wherever needed in a clinical setting. It is easy to operate and can be used by the patient for self-treatment in cases of chronic pain. Of course, the Vertetrac is ideal for treating sports teams on their premises. If used in addition to chiropractic treament, patients with muscle spasm will benefit by using it for 15′-20′ before treatment, affording a more in-depth and less painful treatment session. Another advantage of using the Vertetrac spinal decompression device is due to it being a portable device that can be easily stored on a shelf or in a cupboard, something that is not possible with a decompression table, which takes up a lot of space in the clinic. As you may have guessed by now, chronic patients can self-administer the treatment at their own convenience. Positioning of the device is best implemented in front of a mirror. Typical treatment sessions are relatively short, only 20-30 minutes, and can be easily fitted into a patient’s busy schedule. 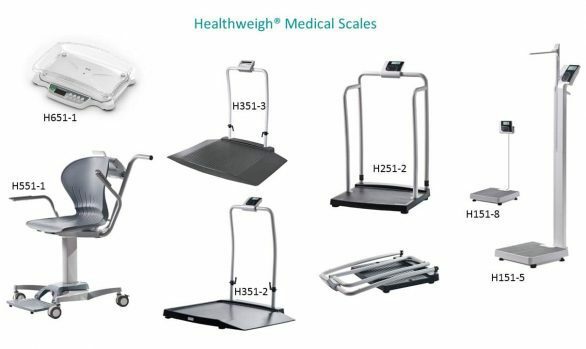 Patients don the device with full freedom to move about during treatment. In fact, we recommend that the patient walks to enable a rapid recovery and return to every day life. 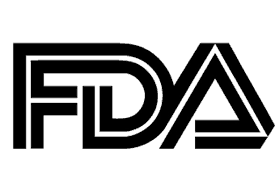 All Meditrac products carry the CE mark & FDA approval.